The in-car entertainment specialist has integrated an NFC-driven personalised dashboard into a Dock+Go concept car, enabling drivers to automatically set seating and entertainment preferences — and make travel bookings on the go without having to stop to enter card details. In-car entertainment specialist Harman, whose solutions are built into 25m vehicles around the world, is demonstrating a personalised dashboard concept at the Geneva Motor Show this month. The solution uses NFC technology to identify the driver so that the vehicle’s infotainment console can be automatically set to reflect their individual seating and entertainment preferences. For the Geneva show, Harman has built its technology into a Dock+Go, a concept car that comes with add-on modules allowing the driver to add extra seating and storage space to the vehicle as required. In the future, Harman has told NFC World, the technology could also be used to provide an electronic signature via NFC. This would allow a driver to make online travel bookings and other payments in the vehicle, via an in-car reader known as a Touchpoint which would be connected to the Harman infotainment system, without entering passwords or pins. The company is developing an NFC solution for a European OEM, Harman added, and the first vehicle to include its technology is expected to be launched by the end of 2012. 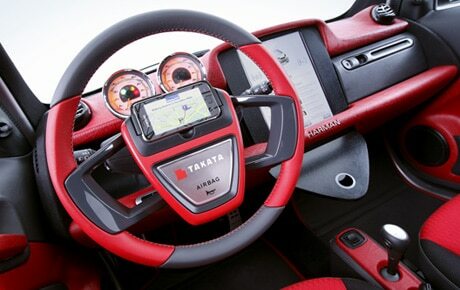 For the Dock+Go concept car, Harman has combined NFC with its cloud-based Aha content and information platform. When a driver gets into the vehicle, they place their NFC phone in an NFC dock located on the interior of the steering wheel, allowing the Harman system to recognise the driver and call up a range of saved preferences. These include seat positions, favourite music, settings for the Harman sound system, and email, contact and calendar entries as well as Facebook and Twitter accounts.